With onions, addition of green or red peppers, etc. Spanish omelette is the English name for a traditional dish from Spanish cuisine called tortilla española, tortilla de patatas or tortilla de papas. It is an omelette made with eggs and potatoes, sometimes also with onion and/or chives or garlic; fried in oil and often served cold as an appetizer. It is part of the cuisine of Spain. In Spanish tortilla is the diminutive form of torta "cake"; this dish is called tortilla de patatas or tortilla española to distinguish it from a plain omelette (tortilla francesa, literally "French omelette"). These dishes are unrelated to the maize or wheat tortilla of Mexico and neighbouring countries, which is a thin flatbread. In most of Hispanic America, where both the flatbread and potato omelette are eaten, the omelette is called tortilla española to distinguish it from the maize tortilla of the region. Because the potato is called papa in much of Hispanic America (instead of the term patata used in Spain), this dish can sometimes be referred to as tortilla de papas in that region as well. The Spanish tortilla (tortilla de patatas in Spain) is widely eaten in Spain and some Spanish-speaking countries. While there are numerous regional variations, the basic version is made only with eggs and potatoes, and possibly onion. The addition of the onion is often controversial and usually related to the tenderness of the local varieties of potatoes. To avoid confusions some restaurants distinguish between the plain tortilla de patatas and the tortilla de patatas con cebolla (with onion). The potatoes, ideally a starchy variety, are cut into thin slices or small dice. They are then seasoned and sautéed in cooking oil, with sliced onions being added at this stage if used. These ingredients are stirred at a moderate temperature until they are soft but not brown. The potatoes (and onions, if included) are then removed, drained, and mixed with beaten eggs. This mixture is then returned to the pan and slowly fried, turning to fry both sides. Once the eggs are cooked on one side, a pan should be placed over the mixture and it can be inverted onto the separate pan or plate. The mixture is then slipped back into the pan to cook the other side. The essential ingredients are eggs, potatoes, and salt; onion or garlic is sometimes added; seasonings such as pepper, parsley or oregano may be added as well. Other ingredients such as green or red peppers, chorizo or other sausage, tuna, shrimp or different vegetables, may also be included as well, although the result is not strictly a tortilla de patatas/papas. The Spanish government nutrition web site specifies extra virgin olive oil and includes onion, but some recipes simply state vegetable oil. The tortilla may be eaten hot or cold; it is commonly served as a tapa or picnic dish throughout Spain. As a tapa, it may be cut into bite-size pieces and served on cocktail sticks; a large tortilla can be cut into triangular portions (pincho de tortilla) to be eaten as a finger food. The first reference to the tortilla in Spanish is found in a Navarrese document, as an anonymous "Mousehole's memorial" addressed to the Navarra region's court in 1817. It explains the sparse conditions of Navarre's farmers in contrast with those in Pamplona (the capital) and la Ribera (in southern Navarre). After listing the sparse food eaten by highlanders, the next quote follows: "…two to three eggs in tortilla for 5 or 6 [people] as our women do know how to make it big and thick with less eggs, mixing potatoes, breadcrumbs or whatever." According to legend, during the siege of Bilbao, Carlist general Tomás de Zumalacárregui invented the "tortilla de patatas" as an easy, fast and nutritious dish to satisfy the scarcities of the Carlist army. Although it remains unknown whether this is true, it appears the tortilla started to spread during the early Carlist wars. Another tale is that the recipe was learnt by Spanish prisoners captured after the Battle of Montes Claros during the Portuguese Restoration War in 1665. After the Portuguese victory, more than 6000 Spanish soldiers were kept in captivity for 2 years until the Treaty of Lisbon was signed. 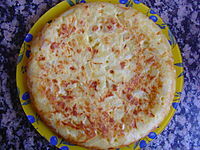 Upon their release, these prisoners brought part of the culture of Alentejo to Spain, including many recipes, which featured a potato egg pie that evolved into the modern version of "tortilla". Spanish omelettes can range from authentic and carefully made seasoned preparations of raw potatoes of a variety carefully selected for best results, eggs, optional onions and good olive oil and nothing else, to nontraditional preparations with many additional ingredients. Some of the many additions to the base ingredients include green peppers, chorizo, courgette, aubergine, mushrooms, and diced ham. The tortilla paisana includes red pepper and peas. The tortilla is supposed to be juicy and usually fairly thick, ranging from about 3 to 8 cm (1.2 to 3.1 in); circumference ranges from a small individual tortilla to about 30 cm (12 in). In Spain a tortilla is almost always accompanied by bread and sometimes with fried pimientos de padron. In most bars and canteens, it is served in a sandwich (bocadillo). A tortilla will remain juicy for around 24 hours, after this it will solidify (see picture to the right). A very large tortilla was made by 12 chefs in Vitoria, Spain in 2014, claiming to be a record. It was 5 m (16 ft) in diameter, and used 1.6 tons of potatoes, 16,000 eggs, 150 l (33 imp gal; 40 US gal) of oil, 26 kg (57 lb) of onions, and 15 kg (33 lb) of salt[dubious – discuss]. ^ a b "Real Spanish omelette". Bbcgoodfood.com. Retrieved 10 January 2016. ^ "Receta de Tortilla de patatas o tortilla española" [Recipes for tortilla de patatas or tortilla española]. solorecetas.com (Spain) (in Spanish). 20 February 2018. Retrieved 5 March 2017. ^ Cloake, Felicity (2010-07-29). "How to make a perfect Spanish omelette". the Guardian. Retrieved 2018-07-06. ^ (Spanish) Los "memoriales de ratonera" eran escritos que cualquier ciudadano navarro podía depositar en un buzón ("ratonera") cuando se reunían las Cortes; véase José María Iribarren: "El comer, el vestir y la vida de los navarros de 1817, a través de un 'memorial de ratonera'", en: Príncipe de Viana 17, núm. 65 (1956), pp. 473-486. Wikimedia Commons has media related to Spanish omelette. This page was last edited on 15 April 2019, at 00:16 (UTC).